A Glock is simply one of the most balanced pistols out there. You know exactly what you’re getting when you purchase a Glock: a dependable weapon that’s easy to shoot but not always the most comfortable to hold. Yes, I know that Glocks attract almost as many haters as they do diehard followers…but they’re good guns, especially if you’re a noob looking to get comfortable shooting a handgun for the first time. Another reason why I think owning a Glock is a must for every shooter is the gun’s customizability. 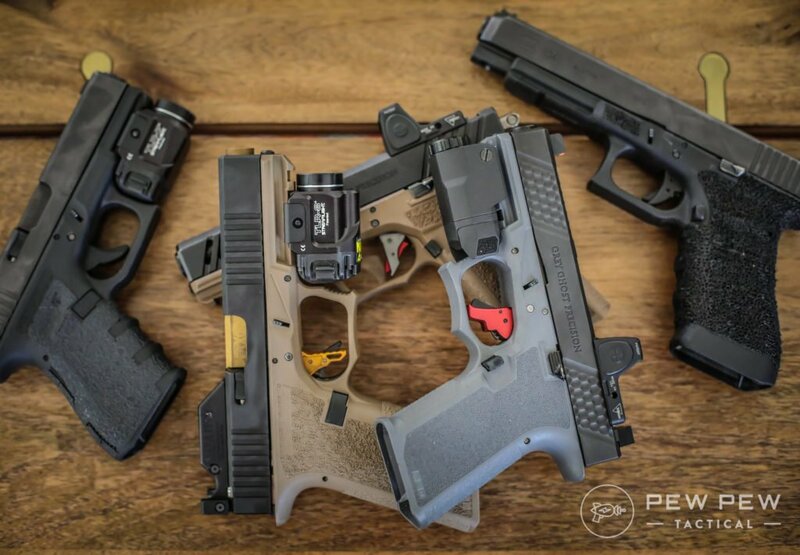 Thanks to Glock’s popularity, they’re one of the easiest pistols to upgrade and modify. Since Glocks come finely tuned fresh out of the box, you wouldn’t need to upgrade one to improve performance. Still, it’s nice to have the option to customize your Glock if need be. Today we’re going to look at some aftermarket Glock barrels that can boost the accuracy and performance of your already awesome gun. Why Get a Replacement Barrel? 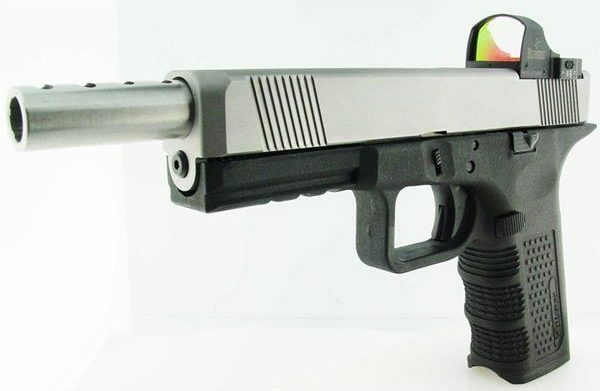 Since Glocks are known for their unparalleled quality, the idea of spending money on an aftermarket barrel might seem strange. 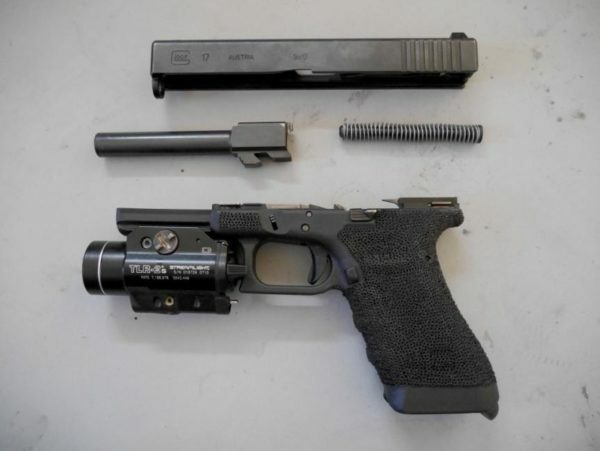 After all, Glock has carefully designed all their working parts to provide maximum performance. And while Glock’s reputation for top performance is well earned, their barrels do have one limitation: lead bullets. Most shooters looking for an aftermarket Glock barrel aren’t doing it for the sole reason of shooting unjacketed rounds. 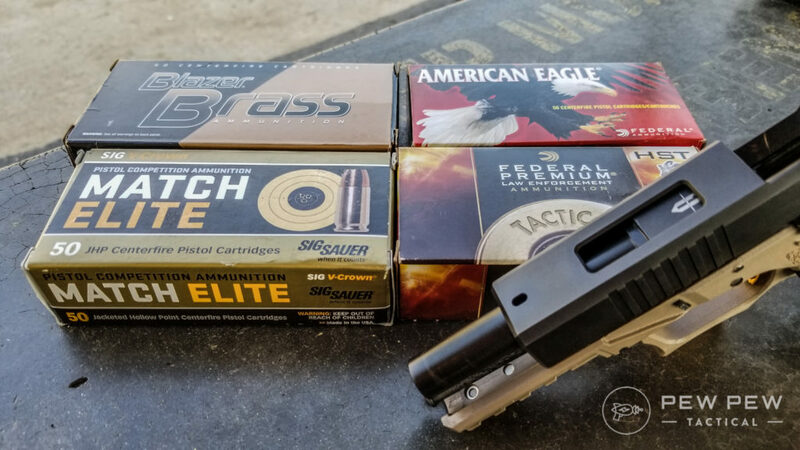 While lead ammo is a nice perk to having an aftermarket barrel more often than not, people interested in replacement barrels for their Glock are more concerned with competition grade barrels that can help them increase their accuracy when squeezing off rounds. Many competitive swear by these match grade aftermarket Glock barrels when using premium ammunition. Furthermore, the general consensus is that average quality ammo tends to fire better in an OEM barrel than an aftermarket one. So make sure to keep that in mind when deciding whether you want to swap out your Glock barrel or not. Without further ado, let’s take a look at some popular aftermarket barrels that can upgrade the accuracy of your Glock. Faxon is new to the Glock world, but their AR-15 Barrels, Handguards, and Bolt Carrier Groups have been impressing us for a while. 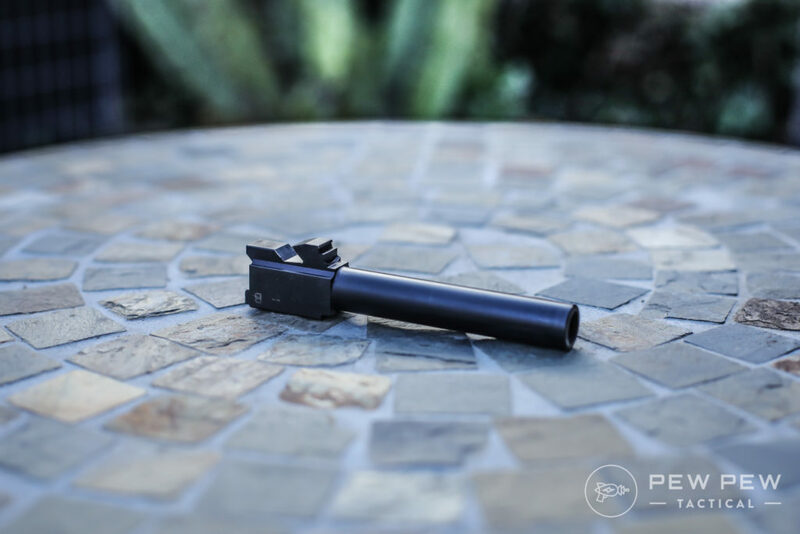 The Full Review really brakes down what we think of Faxon’s Glock barrels, bottom line: they’re awesome. Earning a sold 5/5 rating from us in reliability, accuracy, looks, and value. Oh…and there’s also some really awesome coatings. If your wallet is light, Victory might be right for you. 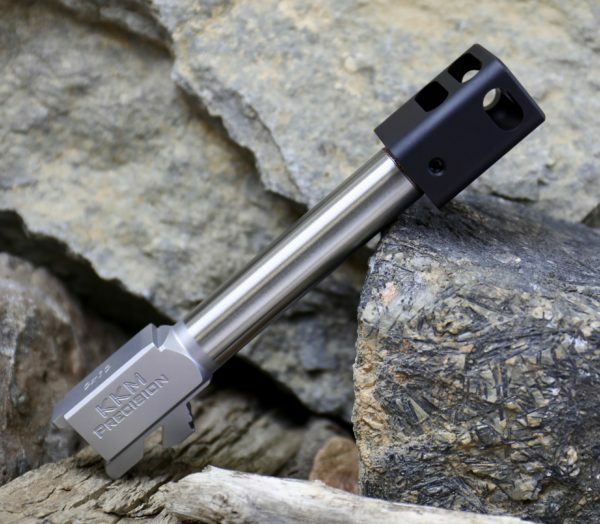 A decent barrel for a great price, Brownells has you covered. 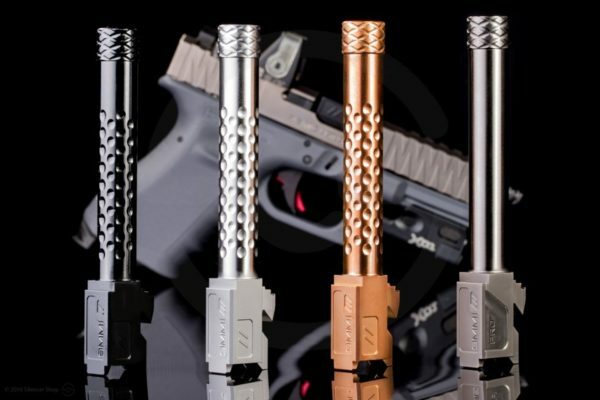 Available for the Glock 17, 19, and 43 in both threaded and standard with all of them finished in Black Nitride it is easy to find a barrel that fits your needs. 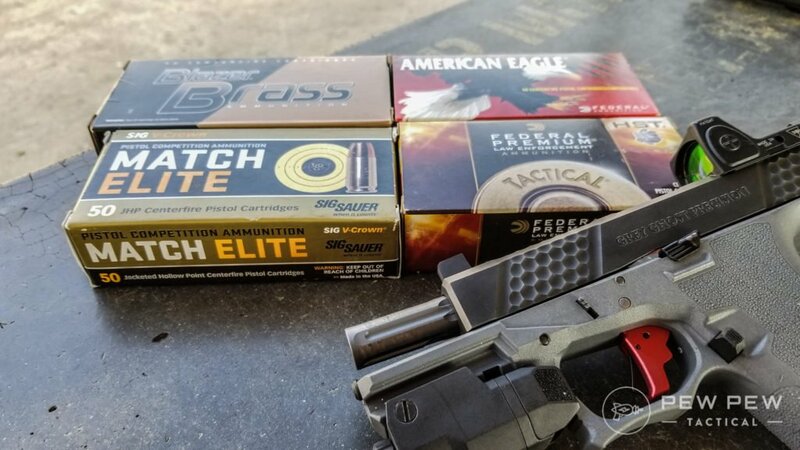 We tested a G17 Victory First barrel with several types of ammo at 10 yards. 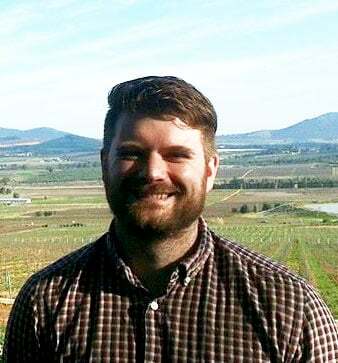 Not too shabby…especially for the most affordable barrel in this whole article. 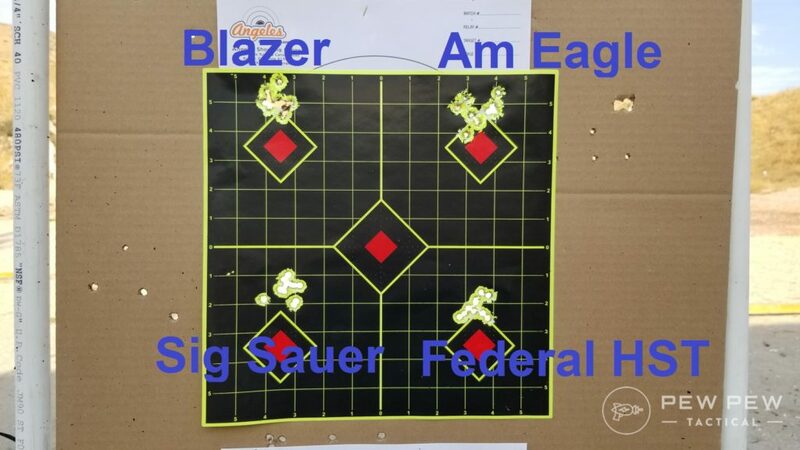 It seemed to like my plinking Blazer 124gr and American Eagle 115gr. We did an In-Depth Review of this slide/barrel combo that you should totally read. But the bottom line is, the barrel is awesome. The slide is awesome. And they both fit together amazingly. One of the best things about Grey Ghost is the number of options you have. 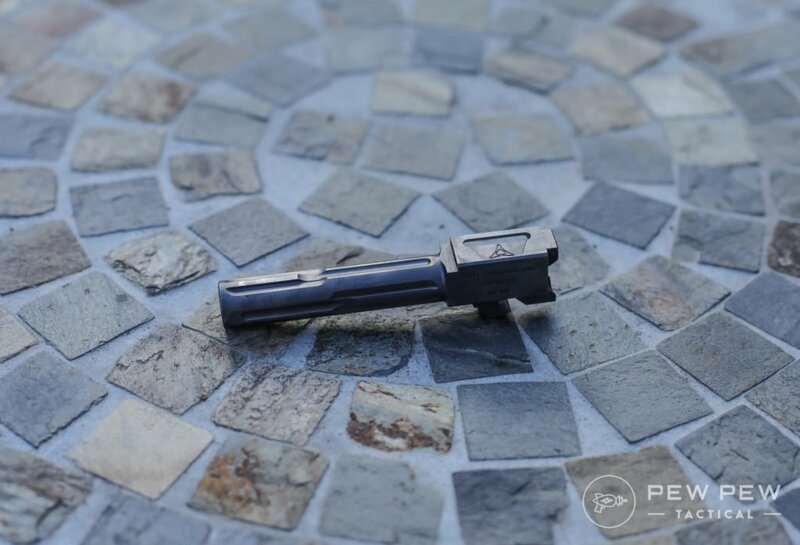 Threaded barrel, non-threaded, RMR cut, non-RMR cut, complete slide with Barrel, stripped slide with no barrel or just the barrel – every one of these options is available to you for both the Glock 19 and the Glock 17. Lone Wolf has earned the reputation of being the leading manufacturer of aftermarket Glock accessories in the industry. They are the company that made it possible to rebuild a Glock completely with third-party parts, after all. 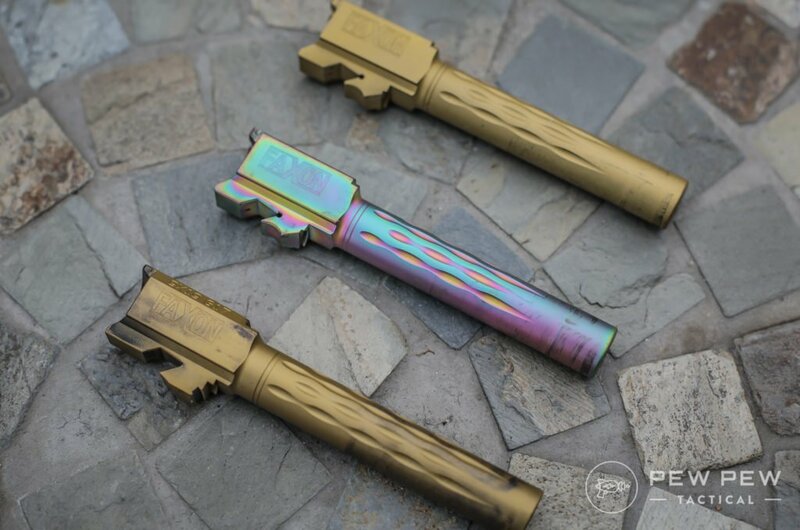 While it should come as no surprise that Lone Wolf makes their own Glock barrels as well, you might be interested to know that they don’t just produce OEM replicas – they also make completely unique barrels that stand out from their factory counterparts. 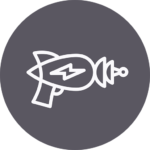 Lone Wolf’s line of Alpha Wolf barrels let the shooter have more control over their gun’s operation. 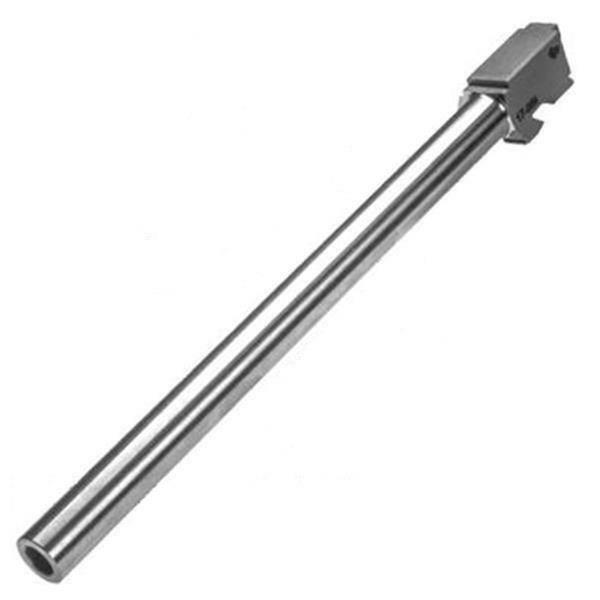 One of the chief differences between Alpha Wolf and Glock OEM barrels is the option of barrel threading, which is something that Glock simply doesn’t do. And if you’re planning on mounting a suppressor, not having a threaded barrel can turn a simple attachment into the world’s largest headache. Fortunately, Alpha Wolf saves the day with their line of threaded barrels for most Glock models. 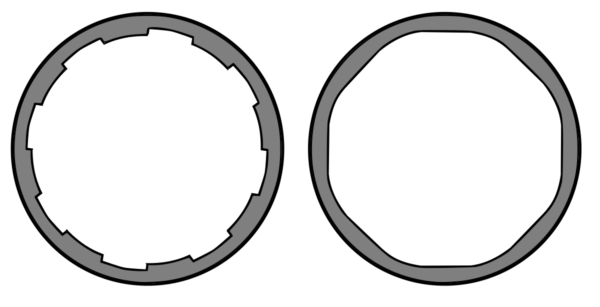 Lone Wolf’s barrels also ditch the hex / polygonal rifling for traditional rifling. The benefit of this is that you’re able to shoot lead ammo with a Lone Wolf barrel without worrying about the dangerous buildup of deposits which Glock warns against with their factory barrels. But this convenience and increased savings on ammo come with a price, as the consistency and precision associated with Glock’s advanced rifling pattern are also negated. Still, unless you’re shooting in a 3Gun competition or similar, you probably won’t notice that much of a difference between your OEM barrel and Alpha Wolf variant. The coolest thing about Lone Wolf’s barrels isn’t the threading or the extended length barrels, it’s the conversion kits. Lone Wolf has a number of different barrels that converts various Glock models from one caliber to another. These make it easy to turn your G35 into a .357, your G29 into a .40S&W, and so on. 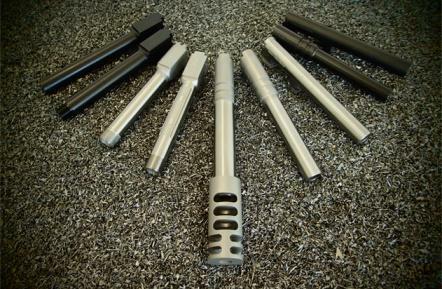 KKM is one of the leading manufacturers of match grade drop-in Glock barrels. Designed for competition shooting, KKM’s barrels are a popular choice for Glock owners looking to gain a competitive edge with their accuracy. Additionally, KKM barrels are also great for shooting non-jacketed bullets as well, which is perfect for anyone who has a surplus of lead ammo they’d like to get rid of. You’ll find that a large portion of the Glock owners shooting with KKM barrels belong to 3Gun crowds. This is because KKM barrels are known to improve accuracy thanks to their button rifling which irons the rifling pattern into the barrel rather than cuts it. That, and the fact that KKM barrels increase tightness in the chamber is said to give competitive shooters a slight advantage over OEM barrels. Overall, KKM’s button rifling is great because it gives you the opportunity to shoot with cheaper bullets than your standard factory Glock barrel. And while you’ll have no problem shooting reloads with a KKM barrel, you won’t get the same level of reliability and consistency that’s comes from Glock’s hex rifled barrels unless you’re shooting premium match quality rounds. If you’re looking to add a KMM barrel to that Glock that you use for home defense, you might want to reconsider. Your factory barrel will be more dependable when squeezing off run-of-the-mill ammo in a pinch. But if you’re trying to improve your accuracy in a competitive setting where you’re using only high-quality loads, KKM can do wonders for your grouping. 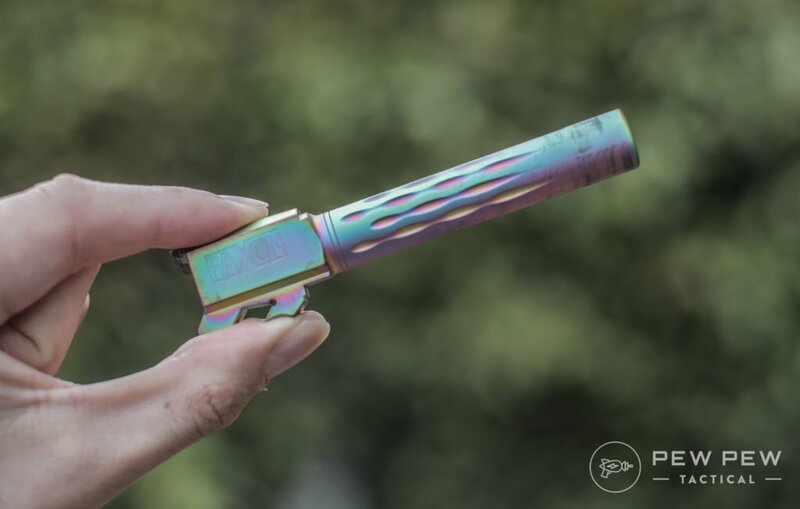 If you know a thing or two about modding Glocks, chances are, you’re already familiar with Zev due to the fact that they make some of the coolest slides and most responsive triggers for Glock models. Zev barrels don’t just come in pretty colors like bronze and stainless steel so that your Glock looks as menacing as it shoots. They’re also made with a match grade steel that’s not only resilient but able to withstand excessive pressure from shooting with a suppressor. Many also come with the option of being threaded as well, making it simple to mount a suppressor if you’ve got one. Another advantage that comes with shooting with a Zev barrel is increased versatility. While Glock’s OEM barrel is perfect in almost every way, it restricts the shooter to FMJ rounds. But with Zev’s upgraded (and ostentatious) barrel, you’re also able to shoot less expensive lead rounds dependably and safely. But the best quality about Zev barrels isn’t their flashy appearance or ability to spit out lead bullets, it’s the improved durability that comes with the pre-hardened stainless steel barrel. 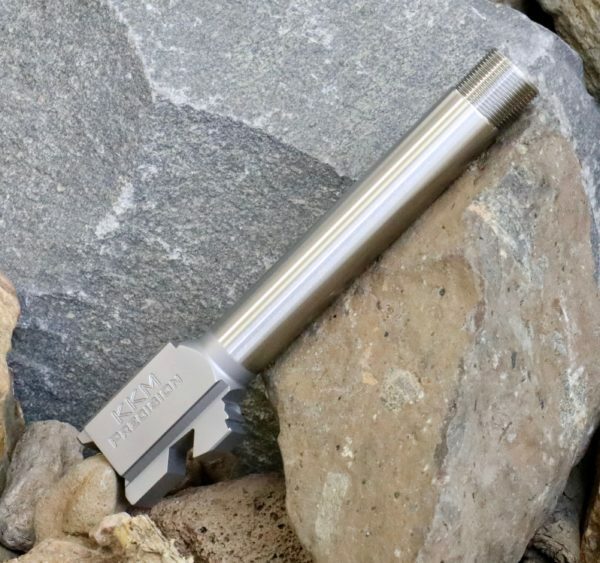 It might be hard to fathom how a company could improve the durability of Glock’s already pristine parts, but Zev somehow manages to do this by designing a barrel with improved resistance against friction and corrosion. And as an added bonus, all of Zev’s barrels are drop-in barrels, so you don’t need any gunsmithing expertise when swapping out your OEM barrel. The new kid on the block is Killer Innovations. Their claim to fame is their single point cutting system for their rifling which is more precise. 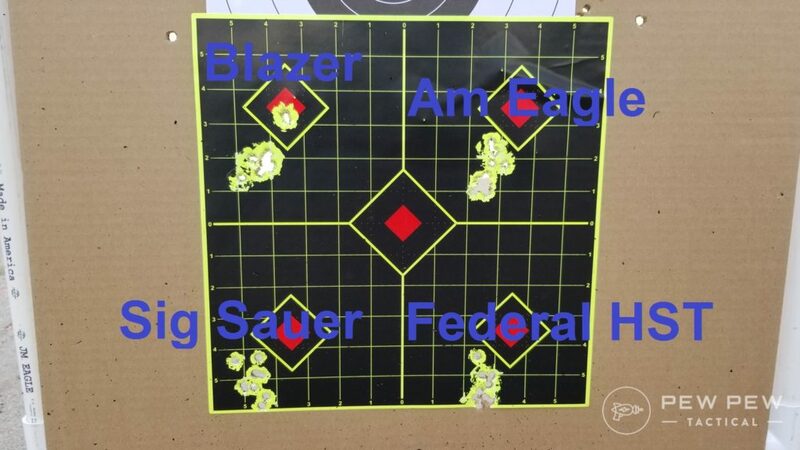 We ran in through a couple builds and also shot different types of ammo at 10 yards. Quite good for the compact G19 barrel and frame! Check it out if you like a different pattern of the exposed barrel…plus if you value accuracy above all. Glock markets itself as perfection straight out of the box. And if you can get past the blocky handle of pre-gen4 models, they really are almost perfect. But that doesn’t mean that you can’t take an already optimal design and tweak it to suit your sensibilities! Switching the barrel is just one of many things that you can to do turn your Glock into something that accurately reflects you. Pair up your new barrel with one of our favs in Best Glock Slides. 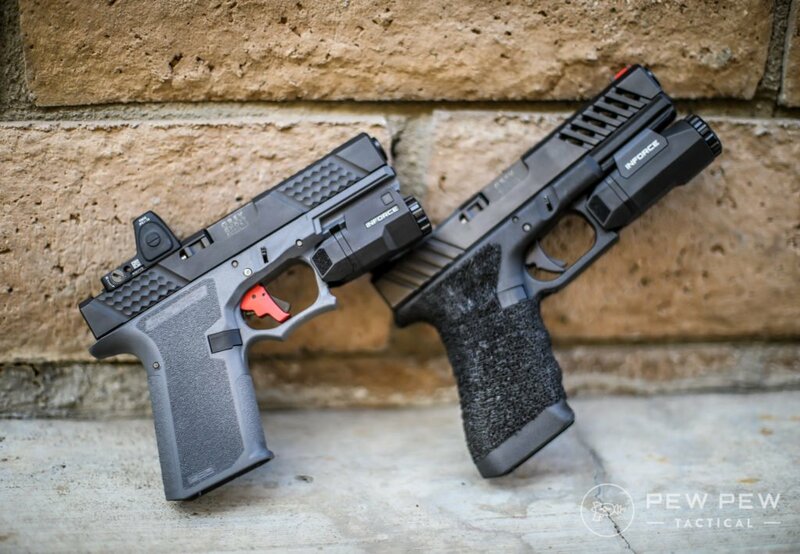 Or if you want to swap out even more stuff…check out our Best Glock Upgrades. Another good Glock or Polymer 80 barrel is from Heavy Armor Division. They’ll even engrave your bbl for FREE! No relationship with them other than as a satisfied customer. Any feed back on Bear Creak Arsenal? $50 barrels. I saw some videos that it provides OEM accuracy. A threaded barrel for $50 is a great price if it lasts and provides good accuracy. After my experience with a .458 Socom BCA complete upper, I’d steer clear of them. They seem to have a lot of QC issues. Thankfully they were easy to work with on the return and refund. I’BE HAD 2 KKM BARRELS ON A GLOCK 26 , and both shot high . After that I put the factory barrel back in , and was hitting point of aim . Could you please tell me what was going on there ? That would be something you’d have to talk to KKM about, sorry. As I have been looking a caliber conversations, no one comes right out and admits that the bolt face on the slide has to match the case? I’m sure a ,357 sig. will work in a 40 S&W slide, but there isn’t any way to use 9 mm in say a Glock 22 or 23? Am I correct or not? You can buy a 9mm conversion barrel for a Glock 22 or 23. You can go down in caliber but not up.